"I love these effects! I wouldn't use iMovie without Slick." 20 fully functional Plug-ins for iMovie HD 6 free! 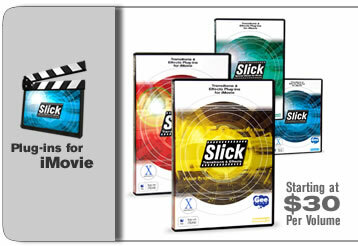 Slick - the first name in iMovie plug-ins. These award-winning transitions, titles and effects advance the capabilities of iMovie HD 6 to help you create video masterpieces. Seamlessly integrated into iMovie HD 6, Slick plug-ins give you the power to add Hollywood style effects to your iMovie projects.